NEKTON-Easy-BARF is the sensible complement for biologically appropriate raw feeding (BARF). 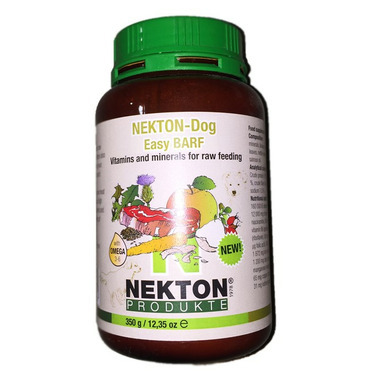 NEKTON-Easy-BARF offers also for beginners the opportunity to provide your dog all the required vitamins, minerals and trace elements. NEKTON-Easy-BARF complements a simple food ration of raw meat and oil to obtain a full meal. Contains a high amount of healthy herbs, natural vitamins and minerals. There is no additional feeding of innards or bones necessary. Directions: Mix daily 1 slightly rounded teaspoon per 10 kg of body weight under the food. Maximum 6 teaspoons per day. Dogs get the double amount during growth and reproduction. Ingredients: Analytical components: Crude protein 1.8 %, crude fat 3.6 %, crude ash 28.1 %, crude fiber 4.6 %, calcium 16.1 %, phosphor 0.1 %, sodium 7.0 % Nutritional additives per kg: 160 000 IE vitamin A, 20 000 IE vitamin D3, 12 000 mg choline chloride, 2 000 mg vitamin E, 500 mg niacinamide, 500 mg calcium-D-pantothenate, 320 mg vitamin B6 (pyridoxine hydrochloride), 176 mg vitamin B2 (riboflavin), 80 mg vitamin B1, 32 mg vitamin K3, 9 600 µg folic acid, 4 000 μg biotin, 1 200 μg vitamin B12, 1 872 mg iron (iron-(II)-sulfate, monohydrate), 1 200 mg zinc (zinksulfate, monohydrate), 144 mg manganese (manganese-(II)-sulfate, monohydrate), 65 mg copper (copper-(II)-sulfate, pentahydrate), 31 mg iodine (calciumiodate, anhydrous). Caution: NEKTON-Easy-BARF should be stored dry and out of sunlight, between 15° and 25°C. DO NOT STORE IN THE FRIDGE.